The Marathon 4' X 6' Kit trailer's galvanized construction offers a scratch and corrosion resistant finish that is long lasting and maintenance free. E-Z Lube hubs offer ease of maintenance and added bearing protection. The V-tongue adds stability when traveling. Conveniently shipped in 2 boxes the trailer can be easily assembled using basic tools. Once complete, the trailer can be customized to suit a variety of needs. 4 ft. x 6 ft. Kit Trailer The Marathon 4' X 6' Kit trailer's galvanized construction offers a scratch and corrosion resistant finish that is long lasting and maintenance free. E-Z Lube hubs offer ease of maintenance and added bearing protection. The V-tongue adds stability when traveling. Conveniently shipped in 2 boxes the trailer can be easily assembled using basic tools. Once complete, the trailer can be customized to suit a variety of needs. 4 ft. x 6 ft. Kit Trailer is rated 3.9 out of 5 by 10. Rated 5 out of 5 by DIYer from Good Build Quality I only wish the wheel is bigger. Otherwise, it's a good quality trailer. Rated 4 out of 5 by Tracy Mulder Rusk from Awseome Trailer Frame This trailer frame is awesome we are building a micro trailer onto this frame, everything about it is exactly what we had hoped for. The only thing which has been mentioned by many in reviews is that the instructions are not as detailed as they should be. I am lucky enough to have a husband who can take apart and rebuild anything but in the event it is someone who is really counting on those instructions with no building ability what so ever, they will definitly have issues with it. Also the bolts, screws and/or washers could be packed in such a way they are numbered because that was quite a bit of sorting that once again is a guessing game for most and I am sure many aren't able to figure it out very easily. Other then that great trailer. Rated 5 out of 5 by Bushwacker from Nice compact trailer I bought this a couple months ago .Good qaulity easy to assemble. Rated 3 out of 5 by Pete from Good but missing parts The trailer itself is fine. However, there were many parts missing, and i had to make 2 trips to the hardware store to buy them. I was at my cottage, 3 hours from the Home Depot, so I paid out of pocket.. Rated 4 out of 5 by Moonview from Good value This is an excellent product but the manufacturer needs to supply more detailed assembly instructions. They provided poor quality photocopies that do not clearly show which way a part fits in. It will take some time to put this puzzle together the correct way - I had to switch bolt sizes on various parts to accommodate parts that were added as I went along. Rated 3 out of 5 by DocksnDocks from Fair I bought this trailer expecting it would be of the same quality and weight as the ones available at our local Home Depot store, not the case. This product is a lighter version but should serve the purpose of hauling 300 lbs dock floats in and out. It took a fair amount of time to put together- 2 people with the right tools took 3.5 hours. Rated 3 out of 5 by Trailer Bob from Solve the puzzle! The trailer is as advertised, but assembling the trailer was a chore. The instructions that come with it are terrible. They look like 10th generation photocopies and are more of a sketch than a clear set of instructions. I build furniture, I do my own car and motorcycle maintenance and it took me twice as long to build, what's a very simple device, than it would have with proper instructions. The edges of the metal are very sharp and it's not possible to wear gloves when you're threading nuts onto bolts so my hands were covered in paper cuts when I was finished. The sharpness of the metal in the cutouts for the wiring harness meant that insulation was being stripped from the wiring when I was threading the wire. Also, the quality of the wire, wiring connectors and the lights provided with the trailer is very poor. The taillight casings are thin plastic of the kind that becomes brittle after a couple years of being exposed to the elements. The bulbs are old school tungsten with bayonet mounts. The wire connectors inside the lights are ridiculous. I had to modify them and solder the connections. The license plate holder is cheap molded plastic and I don't anticipate it will last very long. The holder is configured in a way that leaves the license plate hanging very close to the ground. I will end up buying a separate license plate light and then mounting the plate to the frame because I don't trust that the holder won't snap off (bye bye license plate!) The axle and wheel assembly are quite robust and seem more than equal to the task. I wasn't super pleased with how the leaf springs are engineered to work. They are only attached to the frame at one end. The other ends just floats between the frame and a retaining bolt that runs across the end of the assembly. As you travel across bumps it creates a lot of rattle and bang. The trailer frame is 49" wide and this creates an issue mounting a sheet of plywood to it for decking. The edge of a standard sheet of plywood comes to the center of the frame members and that's where the predrilled holes are. This forces you to leave less than a 1/4" of wood on the plywood edge to bolt through. The alternative is to cut three sheets of wood to lay across the frame instead - an unwelcome added expense. Once assembled the trailer is solid and tracks well at highway speeds. I am not loading it heavily - one 250lb motorcycle - and I'm pulling it with a Honda Fit, manual transmission - no issues. Compared to most trailers this size the fenders are surprisingly solid, however, the way they are mounted to the frame is not strong enough to be able to stand on them. The trailer is light enough that two people can quite easily stand it on it's end against a wall for storage. Other than the miserable assembly instructions and poor quality wiring harness and lights I am pleased with the trailer and it will do the job I bought it for. So, I would have given it 5 stars but took two away for the issues as described. My last question I asked if it is rated for highway speeds, and the answer I got was yes it is if it has the 12 or 13&quot; tires. The description says it has 8&quot; wheels. Does that mean it comes with 8&quot; wheels and 12 or 13&quot; tires? 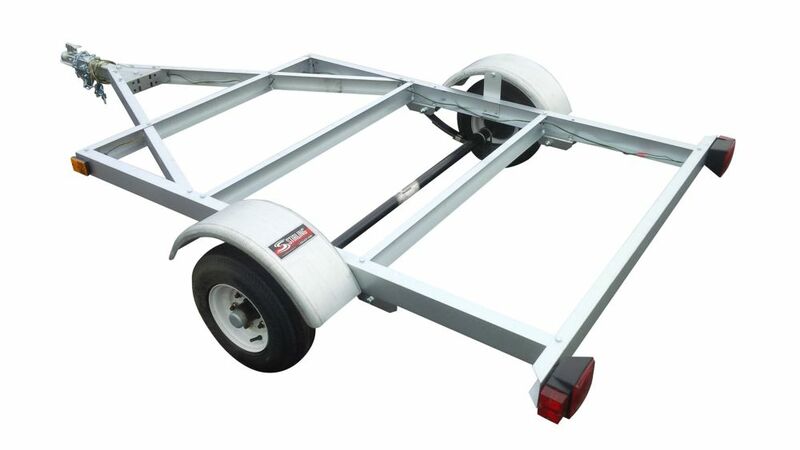 The 4' x 6' kit trailer comes with the 4.80 x 8&quot; LRC tire/wheel assembly. All of our trailers are equipped with tires that are rated for highway speeds. Does anyone know the maximum speed rating for this trailer? Was hoping marathon trailers could reply to this question. And if it is less than 100k/h is it possible to increase the speed rating by upgrading to better tires and or larger tires? Thank You. All Marathon trailers are equipped with tires that are highway rated. Whether your trailer has the 12&quot; or 13&quot; tires both are excellent at high speeds and have been designed for highway towing. The Marathon 4 X 6 Kit Trailer (Model 500101): Is it possible, with little difficulty, to move the axle and wheels towards the back of the frame say 6&quot;-8&quot; as I'd like to build a Micro-Camper on the frame? What is the length of the trailer from the hitch to back end? Hoping to modify it for a small boat. Is it galvanized or will it rust? The ball size required is 1 7/8&quot; class 1 with a minimum of 1 1/4&quot; hitch size. I am looking for an affordable trailer to pick up and haul sheet (4'x8') goods. Will this trailer work, even if it means there will a little bit of overhang on the front/back ends? The width of the trailer is 49.5&quot; slightly bigger than a 4' sheet of plywood, allowing you to haul a 4&rsquo; X 8&rsquo; sheet of plywood with a little bit of overhang on both ends.